Think of the Scottish Borders in a sporting context and the first thing that springs to mind is Rugby Union. There’s a long tradition of competing with the oval ball in these parts with much local rivalry among the Border town rugby teams. However, golf has been played just as keenly for well over a hundred years and Peebles is one of the top Borders courses. Peebles Golf Club was established in 1892 and the original course to the south west of the town can still be seen in outline. In 1934, the current Kirklands course in the north west of Peebles was redesigned by the renowned golf course architect Harry Colt though it has been altered in places down the years due to the encroachment of housing around the periphery of the layout. In more recent times, a modern clubhouse was constructed in 1998 and opened by Prince Andrew. 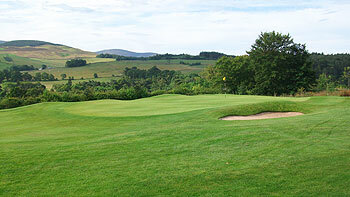 Peebles is a challenging upland golf course of 6,160 yards which is set out in rolling Borders countryside. It is famed for its lush fairways, velvet green putting surfaces and stunning surroundings in the Tweed Valley. The Scottish Girls Strokeplay, Scottish Boys Team and Scottish Girls Amateur Championships have all been held at Peebles in recent years. The opening four holes are all uphill and tough – the 2nd hole called “Sunny Acres” in particular – when played into the prevailing westerly wind. This is balanced by an easier stretch towards the end of the outward half when holes eight and nine lead back down the hill towards the clubhouse. The back nine start out up the hill from the clubhouse, reaching the highest point on the course at the 377-yard 14th. From there on in, it’s largely downhill to the home green where a birdie putt at the 541-yard “Green Mantle” might just conclude the round in fine style. “Peebles for Pleasure” is the local town motto and that certainly holds true for the many visiting golfers attracted to play on the Peebles golf course. The Borders is not well-endowed with quality courses. The fact that the vastly over-rated Roxburghe is ranked #1 in the area speaks volumes. I would personally rather play at Torwoodlee or here at Peebles. Most holes are either up or down the hill on which the course is laid out. There are some lovely views to be had from up top. Starting with a nondescript par 3 (as so many Scottish courses seem to - Crieff, Carnwath, Cochrane Castle, Thornhill to name but a few) the course wends up and down in a pleasant manner. I thoroughly enjoyed the stretch from 4 - 6. 12 is a decent par 3 and the short 16th is , in my opinion, the best hole on the course. The downhill par 5 certainly offers the chance to finish well and, while it is nothing special, Peebles on a nice day is a decent place to play golf. I would submit, however, that it is over-priced. No way is a round here worth £38. Having played at Hirsel recently and been distinctly underwhelmed, I thought I’d return to the Borders to see if the Peebles course was worth its elevated position in the regional rankings. It’s a Harry Colt course so I was interested to see what, if anything remained of the great man’s work from the 1930’s. Sad to say, not an awful lot, as the old course map in the hallway of the downstairs changing rooms verified – though I’d like to sit down and compare exactly the photo I took of this against today’s course map on the scorecard to see how many of the original greens are still intact, even if approached from different angles nowadays. The front nine had me enthralled as the greensites – Colt designs or more recent additions, I’m still not sure – were excellent; slightly raised, subtly contoured and protected by some beautiful bunkers. The dog legged 5th and 6th were stand outs and I loved the double green use for holes 4 and 7. Fairways rise up from the clubhouse then return again at the 9th before the back nine follows a similar pattern. Unfortunately, they were not nearly as engaging as the front nine, though the par three 12th, played across a wee pond, was a fine short hole. So a mark of 4 balls for holes 1-9 and 2 balls for holes 10-18 makes this a very solid 3 baller overall. If nearby Hirsel can make it into a recent golf magazine Top100 chart for Scotland (while ranked below this course on the Top100 site) then the eighteen holes on the hill outside Peebles are worth playing whilst in the area.